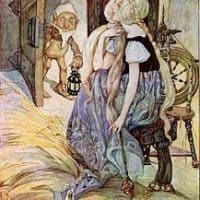 The Classic Fairy Tale of Rumpelstiltskin- A miller tells a tale that his daughter can turn straw into gold. A strange little man is willing to help...for a price. Guess his name and he will be gone...but what is his name? This is the classic fairy tale Rumpelstiltskin Story, originally written by The Brothers Grimm. It is adapted and brought to you by Stories to Grow by. There once lived a miller with his daughter. When the miller was at work all day turning grain into flour, he loved nothing more than to think up tall tales to amaze people. One day the King came to town. He heard the miller talking about his daughter. The miller was saying that his daughter was the most amazing girl in their village, if not in all the land. "You there!" said the King. "What is so amazing about your daughter?" “But I mean…” said the miller. He wished he had not told the King such a thing! But now it was too late. Just then, an odd little man stood before her. "Did I hear you say, 'no one'?" he said. "You can spin straw into gold?" said the girl. "What kind of price do you have in mind?” She did not know if she should trust this stranger. The little man got to work. Very busy he was, all night long. Whirr, whirr, whirr, until morning. By then, not one piece of straw was left in the room – all of it was turned into piles of pure gold thread! “You did it!” said the girl. “A deal is a deal,” said the girl. She took off her necklace and gave it to him. And he was gone. “Look at that!" he said, running the gold thread through his fingers. "Pure gold!" “But I already–!” said the girl. “No ‘buts’ about it!” said the King. And he left, slamming the door behind him. It locked with a click. “Who says?” said a voice. The girl turned. There before her was that odd little man again! So the imp spun the straw all night. By morning, nothing but piles of spun gold thread lay on the floor. The girl gave the ring to the imp, as she said she would do. The next morning, the girl felt sure the King would be so happy, he would let her go home. But alas! If two rooms of gold look good to a king, three rooms of gold looked even better. The King took the girl to the biggest room yet. He had already filled with straw. He told her she must turn that straw into gold by morning. Or else! This time, however, the King said his son was coming back from a long journey that very night. In the morning he would send his son to the room to see if the work was done. If it was, she was to marry the prince. The king thought, "Even if she is a miller's daughter, I could not find a better wife for my son." But he told the girl in a loud booming voice, if she could not do the task, she would marry no one at all for she would die! He told her she must turn that straw into gold by morning. Or else! When the King left, the girl fell into a deep gloom. How long would this go on? Would she ever get out? When she lifted her head, there was that little man again. “I bet you knew I would come back,” he said. “We will find a good price,” said the imp. And he went to work, spinning the straw into gold. But the imp did not stop! He worked all night long. Though the girl waved at him and begged him to stop, hour after hour, it was no use. “That’s not fair!” said the girl. “Lots of things are not fair,” said the imp with a shrug. “Oh, but you already have. The straw is spun into gold. And so the deal is made!” said the imp. And he was gone. A moment later, a young man stepped into the room. "Miss, are you all right?" said the Prince. "I know how hard my father can be." "True, that," she said, and they smiled. This young man seemed very different from his father. "When I am King," he said, "I will not rule as he does." The Prince looked around. He saw the large piles of gold, shining on the floor. "How can you do such a thing?" he said in wonder. The girl said nothing. "I was told that if the straw were spun into gold by this morning, you were to marry me. But know this. If you really want to get out of here, I will help you. Do not worry. I will find a way to tell my father." This young man was very different! The girl wanted to get to know him better. The two stayed in the room and talked about all sorts of things. Before long, they had fallen in love. Then he asked her to marry him. And the girl said yes. So the two were married. It was not long after the wedding when the terrible old King died. The prince became King and the miller's daughter became Queen. In time, the new Queen had a baby of her own, a son. Joy filled the palace. Until one day, when the Queen was alone in the garden. In time the new queen had a baby of her own, a son. “I will give you a castle,” said the queen. “I will give you servants to take care of you,” said the queen. “I will find out who you are,” said the queen. “Oh, REALLY?” said the imp. For he knew that no one on earth knew his true name. Three days is a long time to come up with a lot of names, thought the Queen. And so she agreed. The next day, the Queen wrote a very long list of every name she could think of. That night, in the baby’s bedroom, the imp appeared before her. “Well?” he said in a loud voice. The queen read the whole list of names, one by one. “Could your name be Nathan?” she said. “Lucas?” “Jacob? “Hugo?” “Felix?” “Oliver?” As you can imagine, many other names, too. “Not even close!” laughed the imp. “See you tomorrow night.” And he was gone. The next day, the Queen looked through every book in the royal library. She found names from faraway places. Names she had never heard of. That night when the imp appeared, the Queen read her list. “Perhaps your name is Maximilian,” she said. “No? How about Gunnar?” “Alfonso?” “Pointdexter?” And many more. “This is boring,” said the imp. “But I will not be bored tomorrow night. The third night is when that baby is mine!” He laughed again, and was gone. The third day, the Queen did not know what to do. She wished she could tell her husband her woes, but she dare not. She walked to one side of the room, then back again. Back and forth, over and over. “This does not help a thing!” she said. She put on her royal cape and hood, and walked outside the castle. “If I have peace and quiet, maybe I will think of something,” she thought. The Queen went into the woods. She followed a brook to a big lake, and went past the lake to the deep forest hidden in the darkness. All of a sudden, the queen saw the light of a fire far away. And there was a voice that was hard to make out. There was something about that voice, too, but what? She stepped closer. At last, there in front of a fire, danced a little man. It was he, the very same imp! Very quietly, the queen listened. Tomorrow tomorrow, the baby I take. For Rumpelstiltskin is my name! “RUMPELSTILTSKIN?” yelled the imp. “How could you know?” He was so mad that he stamped his feet. He stamped them so hard that a very big hole opened in the ground, and he fell right down into it. And Rumpelstiltskin was never seen again.